Emanate believes in serving as a positive force across communities in which we operate, while helping staff find a path to support causes they are passionate about. Emanate believes in serving as a positive force across communities in which we operate, while helping staff find a path to support causes they are passionate about. The agency also serves clients with an approach called Relevance Marketing, where we use research, analytics, and testing to reveal the shortest path to success for our clients. These two philosophies have collided to form Relevance Effect – an agency-wide community service program in which Emanate has dedicated 1,000 hours of staff time in 2012 to support community service projects that align with the UN's Millennium Development Goals. The agency selected five global causes: child health, environmental sustainability, eradicating poverty and hunger, promoting gender equality, and universal education, and it is helping a nonprofit organization committed to each find their shortest path to success. As part of Relevance Effect, Emanate also incorporates a community service aspect to agency celebrations. 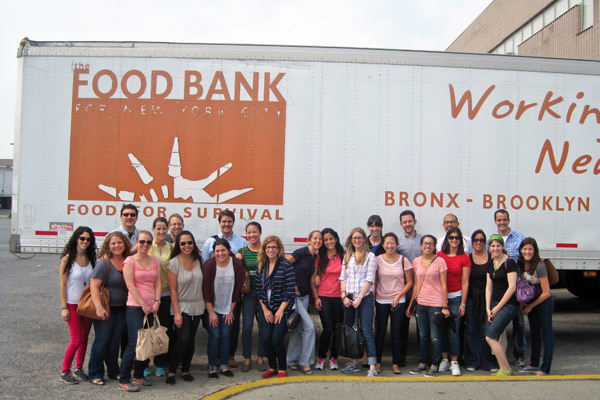 For example, leading up to this year's agency summer party, employees from across the US volunteered at Food Bank for New York City, a hunger relief nonprofit that serves all of NYC. To enable Emanate's employees to experience the full process, reach, and impact of the Food Bank's program, this holiday season the agency will continue supporting the organization by volunteering at locations supplied by the Food Bank. Employees will prepare and serve dinner at the community kitchen in Harlem; assist shoppers, bag groceries, and restock shelves at the Food Pantry; and work food stations serving New Yorkers in need as part of the Food Bank's Meals for Minds program.